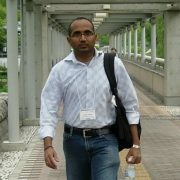 I am a principal researcher at Microsoft Research. My interests are broadly in building and analyzing networked systems. Of late, I have worked on big-data platforms and datacenter networks. I completed my PhD in Computer Science from MIT in 2008. 07/18: Network + job-aware scheduling of cache tiers for data-parallel systems, NetCo, at SoCC. Best paper award. 06/18: Probabilistic predicates at SIGMOD and SIGMOD demo (best demo award). Post on MSR blog. I’ve worked with some amazing interns at MSR. 2019 PC member for NSDI. 2018 PC member for SIGCOMM, NSDI, SOCC. 2017 PC member for SIGMOD, NSDI, SOCC. 2016 PC member for SIGCOMM, NSDI. 2015 PC member for SIGCOMM, SOCC. 2014 PC member for HotNets. Quickr‘s samplers and QO pushdown rules for samplers ship with ADLA. SWAN‘s traffic engineering + approx fairness logic manages traffic on Microsoft’s inter datacenter WAN. RoPE‘s reoptimization logic ships for SCOPE jobs on Cosmos servers since December 2011. Mantri‘s outlier mitigation logic ships in all Cosmos servers since May 2010. Cosmos is Microsoft’s internal big data service with over 10K machines. Flare: Splitting flowlets over multiple paths. Per Conga, implemented and shipped by Cisco Insieme. Also ships with Windows Server 2012 R2; the details are here.